The epidural space is an area behind the spinal cord and spinal fluid that the nerves cross through in order to leave the spine. The spine has many diseases that result in painful inflammation of nerves, ligaments, and discs that may respond to epidural steroid injections. These conditions include disc herniations, spinal stenosis, and arthritis of the spine. Epidural injection provide relief from pain when there is inflammation. Disc herniations are commonly known to produce inflammation of the nerves due to spilling out noxious chemicals from the disc onto the nerve root, causing pain from the back to the hand or foot depending on the location of the disc herniation. Why is an Epidural Steroid Injection offered? Epidural steroid injections are used to treat conditions that affect the spine from the neck to the lower back. These conditions include herniated discs, protruding discs, degenerated discs, osteoarthritis of the spine, spinal stenosis, and scar tissue or other changes following neck or lower back surgery. These conditions may include numbness, tingling, or pain in the extremities. 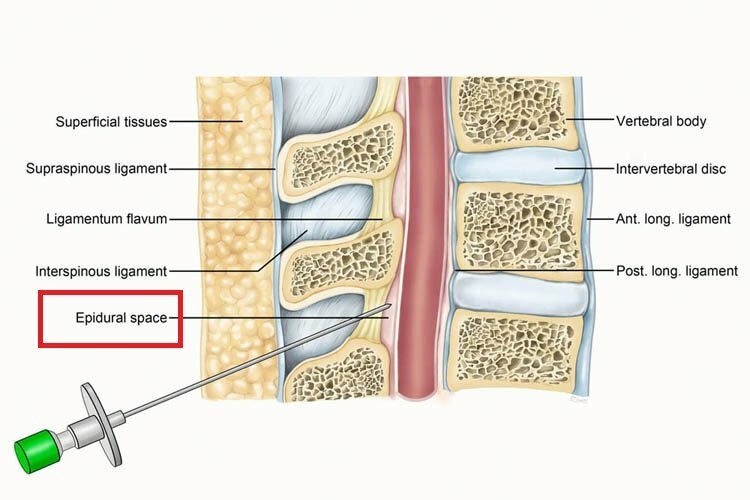 The epidural space is located within the spinal canal one layer superficial to the spinal fluid. Medication such as corticosteroids and /or local anesthetic is injected in the epidural space by the way of a needle or catheter. Epidural steroid injections consist of corticosteroids (not the body builder steroids) that are solids suspended in liquids. The steroids fall out of the solution after injection and serve as a long lasting reserving some of the inflammation. In the neck, the steroid may contain no solids at all and instead a clear solution of steroid is injected. Epidural steroids will not cure spinal stenosis, do not dissolve or reduce disc herniation size They do provide moderate relief lasting typically for 3-24 weeks or longer, and permit greater function while the body is attempting to resorb the disc herniation. Spinal stenosis will not gradually improve over time as is possible with disc herniation, and in the case of spinal stenosis, therefore more frequent injections may be needed. 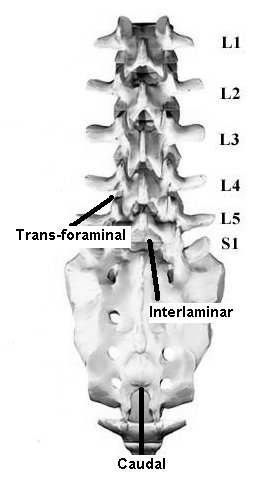 There are three approaches to the epidural space of the low back as seen above: the choice of which often depends on your particular condition.